The J50 was built to celebrate Ferrari’s 50th anniversary in Japan. Ferrari has built some spectacular special edition models over the years, such as the SP1 and SP2 Monza speedsters that debuted in Paris last year. A few years ago, the automaker also launched the fetching J50, which is arguably one of the best-looking modern Ferrari production cars. 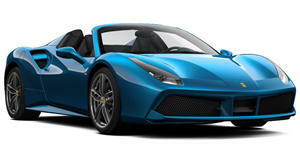 Based on a 488 Spider, the J50 features a unique Targa body inspired by Ferrari’s GTS models from the 1970s and 1980s such as the Dino 246 GTS and 308 GTS. It was built in 2016 exclusively for the Japanese market to celebrate the automaker’s 50th anniversary in the Land of the Rising Sun. Only ten were ever made, and each model was bespoke according to customer specifications. Now, one of them is looking for a new owner. Being based on the 488 Spider, the Ferrari J50 is powered by a 3.9-liter twin-turbo V8 that sends 680 hp to the rear wheels. While the interior is largely identical to the 488’s, the beautiful bodywork is completely unique with a front fascia incorporating a wide mesh grille with thin headlights and a hood with two massive air intakes. At the back, the J50 features a rear wing and quad taillights, while the rear diffuser features an extractor shape inspired by jet engine afterburners. These elements help make the J50 look more aggressive than the 488 it’s based on. Listed for sale on James Edition, this particular Ferrari J50 for sale is located in Japan and only has delivery miles on the odometer. Pricing is available on request, but it's believed the Ferrari J50 was originally sold for between €2 million and €3 million ($2.26 – $3.39 million) depending on the model. We wouldn’t be surprised if the owner is charging a considerable premium to own this zero-mile example.